Majorette were once regarded as the ‘French Matchbox‘ as they made small ‘fit in a three inch box’ models sold at pocket money prices in French shops and supermarkets. Once part of a group with Solido they both ended up as part of the German Simba-Dickie group, owners of Schuco, after they went bankrupt in 2009. In a previous article I have looked at some of their limited editions but here are two models from their ‘Street Cars‘ series which are sold all around Europe on bubble cards like Matchbox or Hot Wheels. 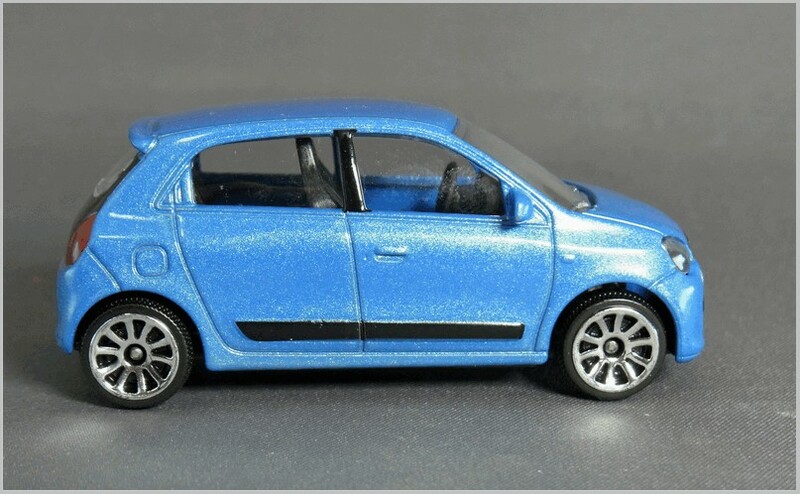 These models are diecast in Thailand to variable scales as they are designed to fit a standard blister pack which is used for all models in the range and doesn’t even have the make and model of the car on it.. 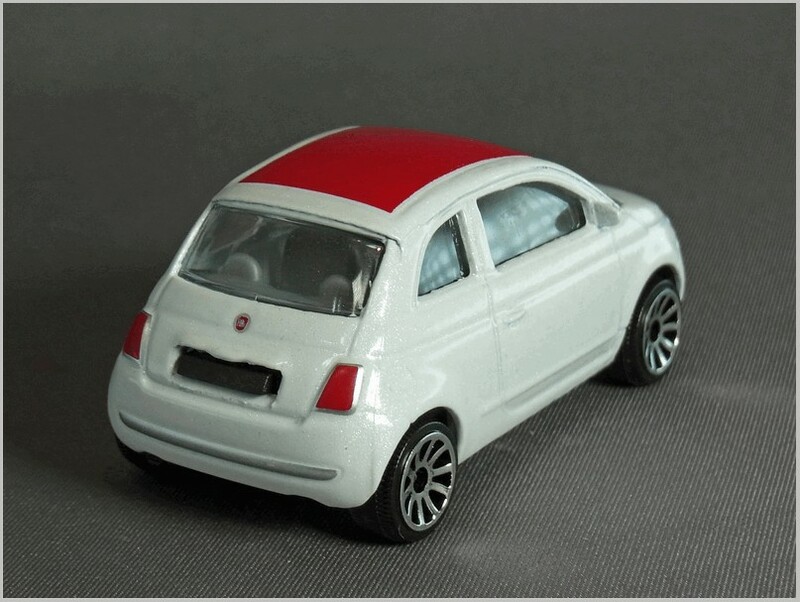 This model of the popular small Fiat is not based on the current version as the rear light printing has yet to be altered to create the body coloured panel in the middle. 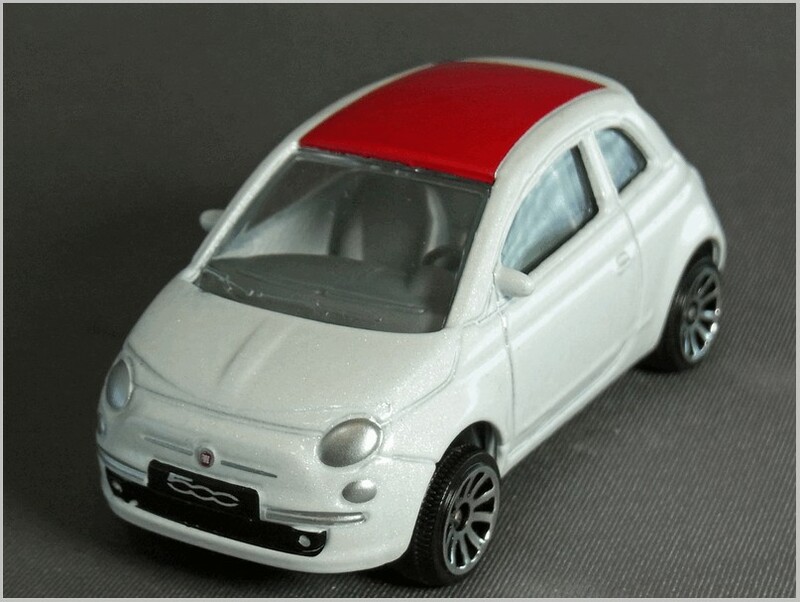 But it is a neat model of Fiat’s baby with the Fiat badges being neatly printed and small enough to need magnification before you can see how accurate they are. The baseplate states that it has been modelled to 1:55 scale. The side profile is excellent and the standard fit ‘speed wheels’ even look like some of the more extreme alloys fitted to small cars. 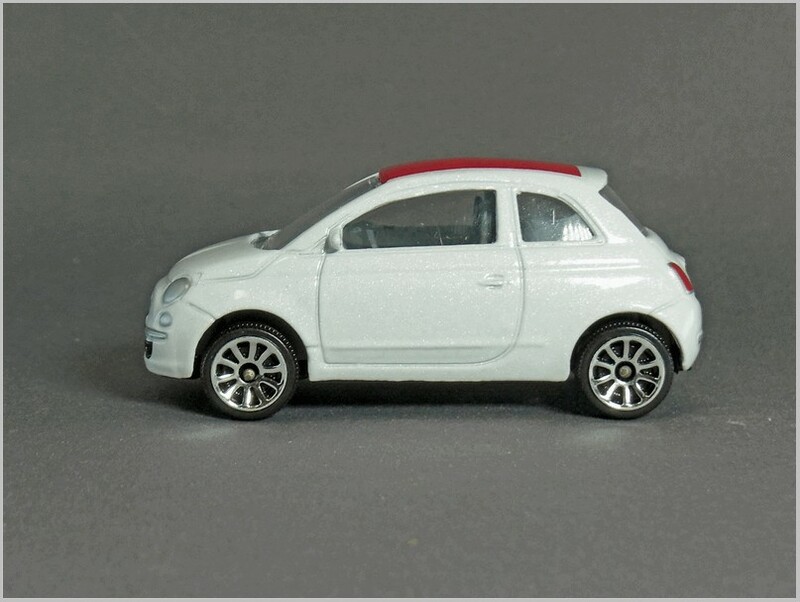 The painting even has a slight hint of the pearlescent sheen often used on these small Fiats. At the front the 500 logo used in advertising is well printed as is the badge and front decorations. Lights are just printed areas of silver paint but they are quite effective. To the rear the rear hatch, lights and number plate areas are well modelled. Though the lights could be properly divided up to reflect the light clusters better. The interior has no door cards but the seats are well represented and the moulded dash board is a good shape and the Fiat gear level mounted in the dash is well modelled. Another popular car with the young, and the first saloon car in a long time with a rear mounted engine. Very much Renault‘s competitor to the Fiat 500 though its four doors make it the more practical and utilitarian of the two. 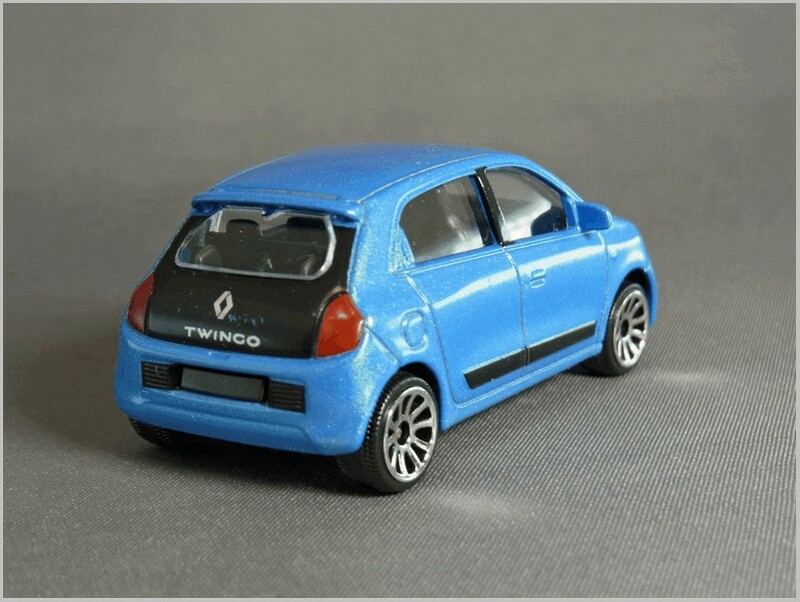 The detailing is pretty close to the current Twingo production model. The baseplate states that this has been modelled to 1:55 scale. The side profile captures the car well. The ‘speed wheels’ again look like some aftermarket alloys fitted to small cars so do not look too out of place. From the front the Twingo lights and grille are exceptionally well represented for a budget model. A dark plastic insert is used which is very effective. Painted small additional lights and the black bumper panel complete a good front end. Again the rear has been well captured with the badging nicely done. Printed rear lights are basic and again should be striped with amber and silver as well as red. Inside again we get no door cards but a convincingly moulded set of seats, dashboard and steering wheel. 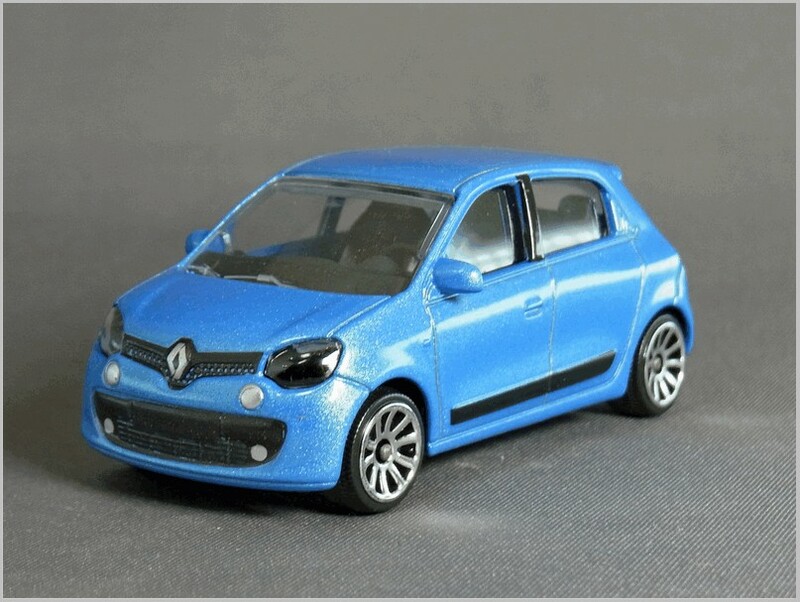 Pocket money toys they may be but they are also good, and reasonably detailed, models of every day cars that can be recognised from the streets.